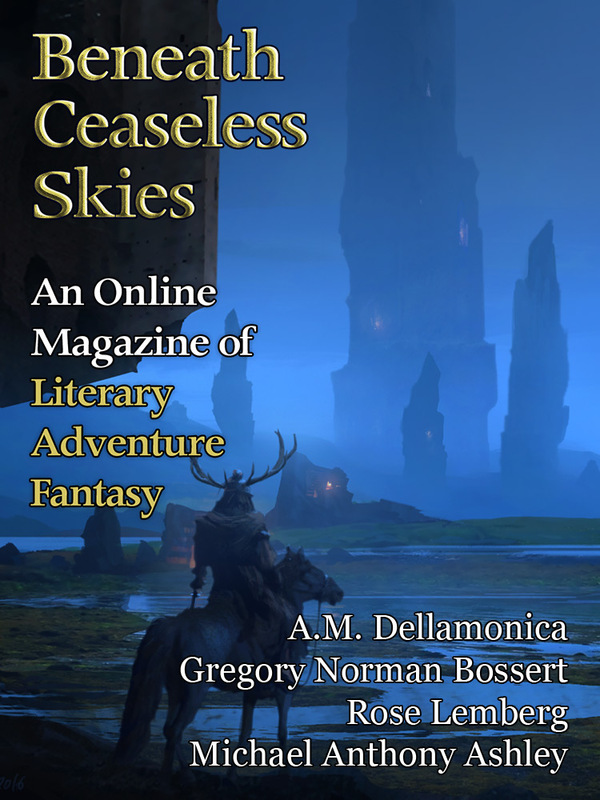 Featuring four stories, a guest-narrated podcast, new cover art by Raphael Lacoste, and a giveaway for a signed Carrie Vaughn short fiction collection. Too late, of course. They pried my mouth open. The old lady spooned a morsel of something—barley, I think—into my mouth. When I spat it back at them, they caught the pieces on a piece of bamboo cut into a jigsaw puzzle piece. This they gave to a spellscribe, who wrote my full name at the top in grass-green ink. The old lady spooned a morsel of something into my mouth. When I spat it back at them, they caught the pieces on a piece of bamboo cut into a jigsaw puzzle piece. She sang those lines with a fierce, forlorn glee. The ballads took her that way, wherever they would, be they sad or glad. It was that blinding, unearthly intensity in her singing, her ability to sway thoughts and glances, that was the reason the townfolk looked sideways and crossed themselves or made the old warding signs. Part of the reason. While she sang, the crowded room was quiet, through her gift the audience made into unlikely brothers. Zilpit-nai-Rinah hit steel against tinder, harder than she’d intended. Her lantern, unreliable and imperfect though it was, would provide enough light for her purpose. She pulled out a pen, her own clever mechanical design that allowed ink to be stored in a small cartridge equipped with a pumping mechanism. She’d used her jeweler’s tools to construct it—more useful than jewelry perhaps, though she had no intention of selling it at market. The little speech sounded odd to Efronia’s ears, as if rehearsed, or written rather than spoken. That’s what the artificers at the department sometimes said about her, too. The fire inside Shams was turning, filling him with a bursting hot hunger, and he would have gulped down every leaf and every tree, the stones and earth, the home and the hill and world for his want of her. “Stay,” he said, and the low branches blackened and curled by his breath. “Stay. Stay. Stay.” She sat with him, sweating but unmoved, and she let him hold her and she let him kiss her, and no more. His hunger remained inside. He had an impression of her—hungry pouncing legs and a thrusted tail and flashing teeth, flashing smile, flashing eyes, and the widest smile in all the world—and then she was past them and gone.